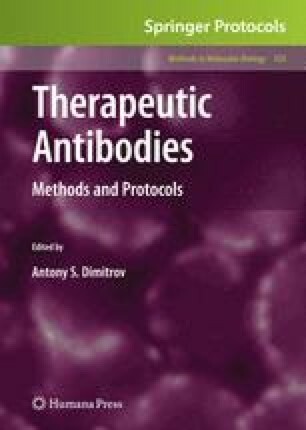 In past years, both laboratory and early clinical studies have demonstrated that bispecific antibodies (BsAbs) may have significant potential application in cancer therapy either by targeting tumor cells with cytotoxic agents including effector cells, radionuclides, drugs, and toxins, or by simultaneously blocking two relevant tumor targets, that is, growth factor receptors, thus neutralizing multiple receptor activation and downstream signal transduction pathways. A major obstacle in the development of BsAb has been the difficulty of producing the materials in sufficient quality and quantity by traditional technologies such as the hybrid hybridoma and chemical conjugation methods. The development of IgG-like BsAbs as therapeutic agents will depend heavily on the advances made in the design of recombinant BsAb constructs (or formats) and production efficiency. Here we describe a recombinant method for the construction and production of a novel IgG-like BsAb molecule, using the variable domains of two fully human antibodies as the building blocks.